, nephew of the preceding, and commonly esteemed the head of the sect of Socinians, was born at Vienna in 1539. He is supposed to have studied little in his youth, and to have acquired hut a moderate share of classical learning and the civil law. He was scarcely twenty when his uncle died at Zurich, and Faustus immediately set out from Lyons, where he then happened to be, to take possession of all his papers. Lrelius had. 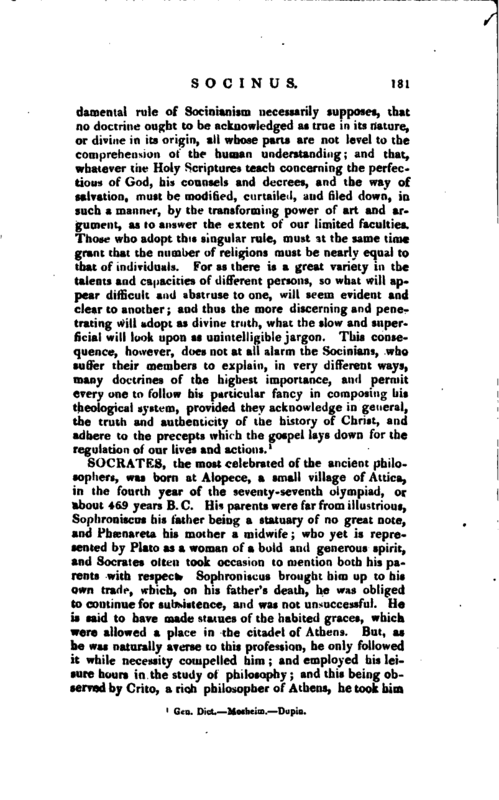 conceived great hopes of his nephew, imparted to him the whole of his opinions; and used to say that what he had inculcated but faintly and obscurely to the world at large, would be divulged in a more strong and perspicuous manner by Faustus. But, although this was ultimately the case, Faustus did not begin to propagate his uncle’s principles immediately upon his return to Italy from Zurich; but suffered himself to be diverted, by large promises of favour and honourable employments already bestowed upon him, to the court of Francis de Medicis, grand duke of Tuscany. 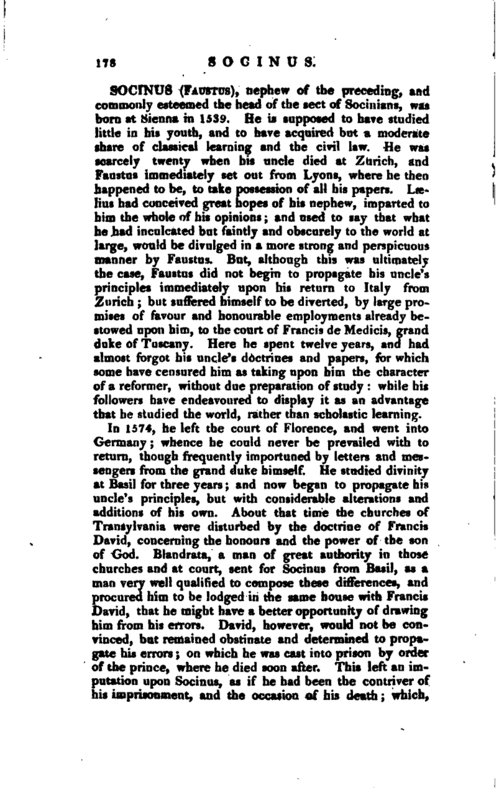 Here he spent twelve years, and had almost forgot his uncle’s doctrines and papers, for which some have censured him as taking upon him the character of a reformer, without due preparation of study: while his followers have endeavoured to display it as an advantage that he studied the world, rather than scholastic learning. In 1574, he left the court of Florence, and went into Germany; whence he could never be prevailed with to return, though frequently importuned by letters and messengers from the grand duke himself. He studied divinity at Basil for three years; and now began to propagate his uncle’s principles, but with considerable alterations and additions of his own. About that time the churches of Transylvania were disturbed by the doctrine of Francis David, concerning the honours and the power of the son of God. Blandrata, a man of great authority in those churches and at court, sent for Socinus from Basil, as a man very well qualified to compose these differences, and procured him to be lodged in the same bouse with Francis David, that he might have a better opportunity of drawing him from his errors. David, however, would not be convinced, but remained obstinate and determined to propagate his errors; on which he was cast into prison by order of the^mnce, where he died soon after. 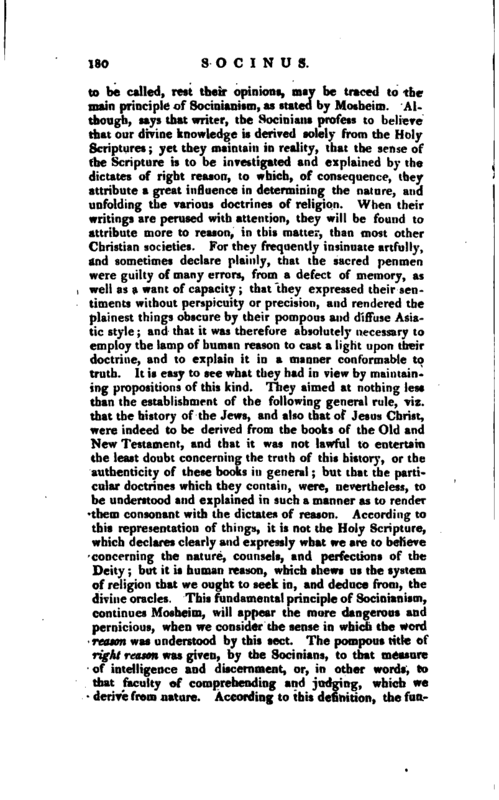 This left an imputation upon Socinus, as if he had been the contriver of kis imprisonment, and the occasion of his death; which, | saysLe Clerc, if it be true (though he endeavoured to deny it), should moderate the indignation of his followers against Calvin in the case of Servetus, for nothing can be said against that reformer, which will not bear as hard upon their own patriarch. In 1579, Socinus retired into Poland, and desired to be admitted into the communion of the Unitarians, or United Brethren; but was refused, on account of his doctrines, to which they did not assent. 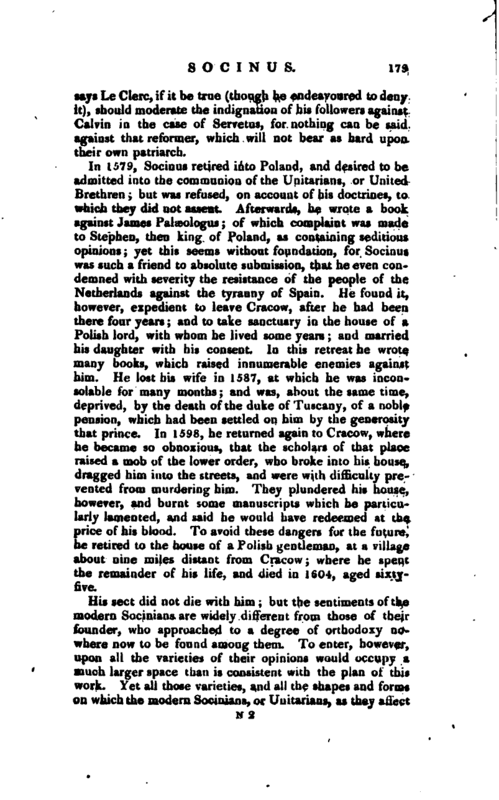 Afterwards, he wrote a book against James Paheologus; of which complaint was made to Stephen, then king of Poland, as containing seditious opinions; yet this seems without foundation, for Socinus was such a friend to absolute submission, that he even condemned with severity the resistance of the people of the Netherlands against the tyranny of Spain. He found it, however, expedient to leave Cracow, after he had been there four years; and to take sanctuary in the house of a Polish lord, with whom he lived some years; and married his daughter with his consent. In this retreat he wrote many books, which raised innumerable enemies against him. He lost Ins wife in 1587, at which he was inconsolable for many months; and was, about the same time, deprived, by the death of the duke of Tuscany, of a noble pension, which had been settled on him by the generosity that prince. In 1598, he returned again to Cracow, where he became so obnoxious, that the scholars of that place raised a mob of the lower order, who broke into his house, dragged him into the streets, and were with difficulty prevented from murdering him. They plundered his house, however, and burnt some manuscripts which he particularly lamented, and said he would have redeemed at price of his blood. To avoid these dangers for the future. he retired to the house of a Polish gentleman, at a village about nine miles distant from Cracow; where he spent the remainder of his life, and died in 1604-, aged sixtyfive.